Having pondered the difference between so-called “civil” and “economic” libertarians for a few days now, and having analysed the issue summaries on Senator RP’s website beyond all reason, it’s now time for a few thoughts on the type of libertarians who tend to gravitate toward the Republican Party. A few months ago, I posted the chart below, which was borrowed without permission from some political scientists who have studied the political ideologies of American voters. Voters (the little dots) in the two rectangles on the left side of the chart are left-wingers on economic issues, e.g., in favor of increasing the minimum wage. Voters in the rectangles on the right side, however, are right-wingers on those issues, e.g., against increasing the minimum wage. Since we’ve only got two big political parties, the populists and libertarians who want to participate in elections often end up choosing between Democratic and Republican candidates. 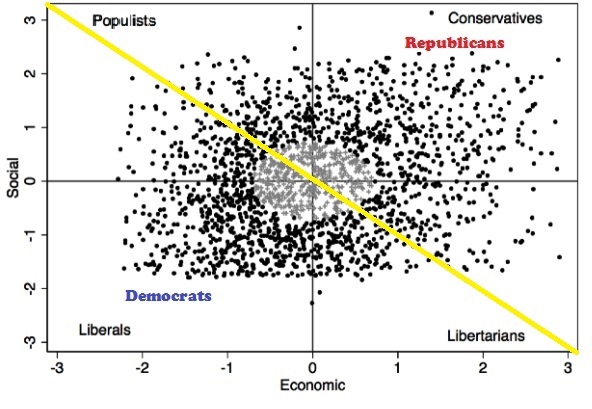 As a rule, the populists and libertarians to the right of the yellow line will vote for Republicans, while the populists and libertarians to the left of the yellow line will tend to vote for Democrats. In similar fashion, people who run for public office will generally join the Democratic or Republican party, depending on the relative strength of their various social and economic beliefs (putting aside any tactical reasons for running in one party or the other). To use the standard terminology, the left-of-the-yellow-line libertarians tend to be “civil” libertarians (maybe even members of the ACLU), while the right-of-the-yellow-line libertarians tend to be “economic” libertarians (maybe they donate to the Cato Institute). Unfortunately, aside from allowing me to play with this great chart, the only point of this discussion so far is to emphasize that there are degrees of commitment to the four political ideologies the chart represents. Someone like Senator RP, for example, who is known for his libertarian tendencies, decided at some point to identify himself as a Republican, apparently because his left-wing, social, civil libertarian views (of which he seems to have some) were weaker than his right-wing, economic libertarian views (of which he definitely has some). All of which serves, finally, as preface to some general remarks about Republican-leaning economic libertarians (which I’ve reorganized as Part 4, because Part 3 doubled in size, even corrected for inflation). This entry was posted in Life, Philosophy, Politics and tagged America, Democrats, Libertarianism, Political Ideology, Republicans by LWF. Bookmark the permalink.